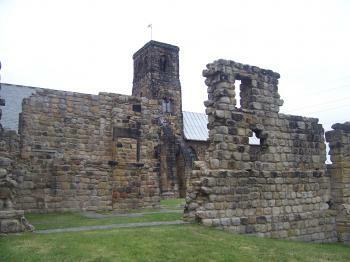 The Twin Monastery of Wearmouth Jarrow is part of the Tentative list of UK in order to qualify for inclusion in the World Heritage List. March 2018 - After the night in Newcastle we vsisted Jarrow early in the morning. It is locate in a smal park, next to highways and a playground. Not worthy for a world heritage site. But the OUV of this site I cannot rate anyway. I dont know that much about architectural history, but there is no buffer zone, and the experience when visiting is modest. On the long drive back from Hadrian�s Wall I decided to make a quick detour to have a view of the UK�s next prospective WHS. So on a very quiet Sunday morning I dove through the suburban streets of South Tyneside to arrive at St Paul�s church in Jarrow, just after that day�s service had started. This stopped me from exploring the interior, however I had really come to see what was outside. The church itself is small, and pretty unremarkable if I am being honest, looking like many other churches across the country. It is set in a pleasant little park just away from the Tyne tunnel and industrial docklands beyond. The ruins of the monastery were actually a little more substantial than I had imagined they would be with several walls still standing. There are explanatory boards dotted around showing the evolution and importance of the remains, but on the whole I wouldn�t say that it was a particularly remarkable place to visit. 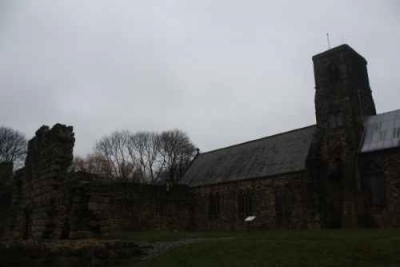 I didn�t make it down to St Peter�s church in Sunderland which is the �Monkwearmouth� part of this site, preferring instead the more classical joys of nearby Durham. I must admit having looked at the pictures of the site I doubt I would go too far out of my way to visit, unless I had other reasons to be in Sunderland. The importance of the two churches in this nomination is that they are the remnants of the twin monastery that once stood here. The Wearmouth site 10 miles south in Sunderland was the founding location; and it quickly spread to a second site in Jarrow. Although this was located in a rather remote outpost at the time it was in fact a rather important institution and had one of the largest libraries in the world at its height of power. The history of the institution is apparently very well documented. The main thing I knew about the site was its association with the Venerable Bede who Paul has mentioned below. He was a rather impressive figure, writing one of the earliest histories of the English peoples as well as creating an authoritative Latin translation of the bible which was apparently still the Vatican�s preferred version up until 1963. There is a good radio documentary on him in the BBC�s excellent �In Our Time� series (I hope it is available outside the UK). The sites have a pretty significant history; however the remains today are really not that impressive. I would be surprised if the site made it the list, though if it did it would be more for what it represents than what is on display today. The location of the sites means they are reasonably easy to tack onto visits to the nearby WHS at Durham and Hadrian�s Wall, otherwise I wouldn�t say they were worth making too much of a detour for. If UK’s nomination for 2012 does gain inscription many people who go out of their way to see it might be surprised at how little is “on view”! It consists of the sites of twin monasteries set up in 674 and 685 respectively – about 8 miles apart, near present day Sunderland. The founder Bishop Benedict “brought workmen from Francia to build these churches, the first ecclesiastical structures in Britain built of stone, and furnished (them) with glass windows, pictures, service books and the library he had collected on his travels. Window glass being unusual in England at the time, Benedict imported glassmakers from Francia, who established a workshop at the Monkwearmouth site” (Wiki) , They flourished until the late 8th and 9th centuries when Viking raids took place. During this time, with their easy access to the North Sea, they played a major part in the exchange of knowledge and ideas across Christian Europe. They were finally destroyed as working institutions by the Danes around 860 although they were resurrected in smaller ways during Norman times. At Monkwearmouth you will see a largely 19th century church of St Peter which incorporates a tower, a few walls and a main door from the original Anglo Saxon church together with additions from c1000 and 14th C. It is set in a grassy area on which the outlines at ground level of the original monastery buildings are marked out – the below ground aspects of the site are considered significant even though they are not “on show”. Its location is close to some social housing blocks of northern central Sunderland and small workshops, relieved by the nearby buildings of the modern Sunderland University. 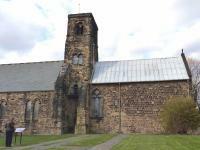 Jarrow also consists of a mainly 19th century church of St Paul but, in this case, the Anglo Saxon element is rather more significant and takes up one complete end (see photo – bottom part of tower and right hand side) – about 1/3rd of the building together with other elements from 11th to 15 centuries. There are also far more walls above ground from the original monastery in the grounds of the church . It is situated on a grassy knoll above a pleasant stretch of the River Don – the chemical and other industries of the Tyne can still be seen but are fairly well hidden. We found Jarrow the more interesting and worthwhile visit. At both churches there were committed parishioners keen to tell the story of their church. There were no entrance fees – just a low key request for a donation. There was a camera fee at St Pauls but I had missed the notice and it wasn’t requested! Among noteworthy elements in this church are the latin dedication stone with the exact date in April 685 that it happened., the small Anglo Saxon glass windows and the early church layout reflecting both Roman traditions and the nature of services at this time. The Jarrow monastery’s main claim to fame is as the home of the Venerable Bede (673-735). He received his education there from Abbot Ceolfrid who had been sent out from Monkwearmouth by Benedict Bishop. They had access to a library brought from Rome by Bishop and, among other things, set about the creation of 3 great complete bibles - 2 for the churches and one as a gift for the Pope. This latter is the only one to survive. It is in Florence and is, apparently, the oldest complete Vulgate bible in the world. Bede went on to become a polymath whose influence on literature, art, ecclesiastical practices, astronomy etc were significant in British and possibly European terms. I don’t know to what extent his name is known outside UK but (nearly) every UK child will have heard of the man and will in some way understand his “importance” – even if not really knowing why!!! My expectation would be that the Nomination File will be very thorough and will have dotted all the i’s and crossed all the t’s . It would seem unlikely that the nomination will fail for lack of process or plan. The bigger issue must be its OUV. Now, as a graduate in Modern History, I must confess to a certain lack of knowledge and interest in matters mediaeval. My mediaevalist colleagues always pointed out that one couldn’t really understand modern history without a good grounding in what had gone before and I can understand that the “battle” between Celtic and Roman interpretations of Christianity was of great importance and that what went on in Jarrow was significant for linking UK to the latter and establishing common “European thought” in this period. But is that enough to warrant inscription? Well possibly. The Minister for Culture states in his Nomination File Forward that the site represents “a category identified as being under-represented on the List, that of the international cultural contribution of the European Early Middle Ages. The Twin Monastery had a profound influence on learning in the Middle Ages and played a significant part in the emergence of European identity. It is an outstanding testimony to the evolution of communal monastic plans and the culture of Christian monasticism which heavily influenced European society, economy and intellectual development, introducing ideas and setting a benchmark for cultural developments that have a lasting legacy more than 13 centuries later”. I presume that ICOMOS will be sending mediaeval experts to evaluate the nomination. They may well be ardent in their desire properly to represent the period and its contribution on the List and even orgasmic at the sight of the few original stones left in place!! I guess the result will depend on their views on these matters. In my own view, unless you are a committed mediaevalist, it only just about justifies the assessment - “worth a visit” (if you are in the area)!